It’s that time of year again where we are looking at our return to the fells. 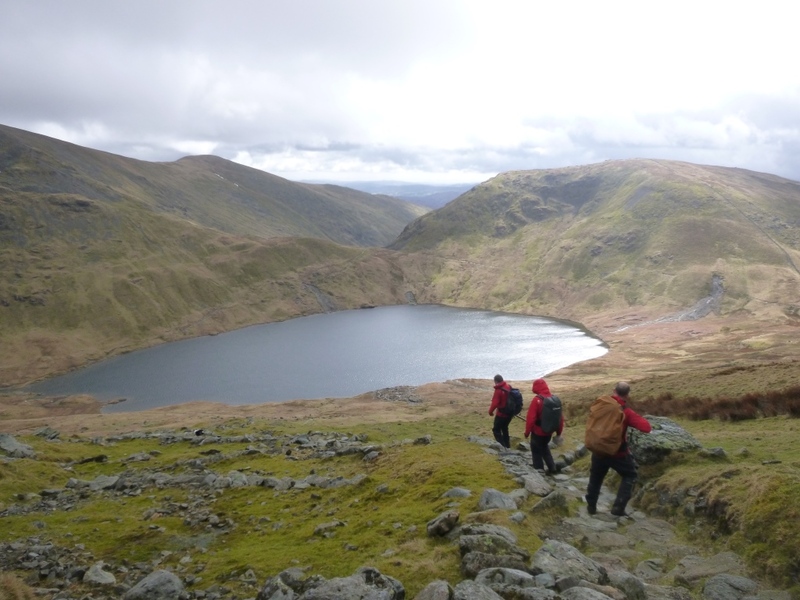 This year our projects will be up on Greenup Edge, Far Easedale, Grisedale Tarn, Tongue Ghyll and Glenamara. 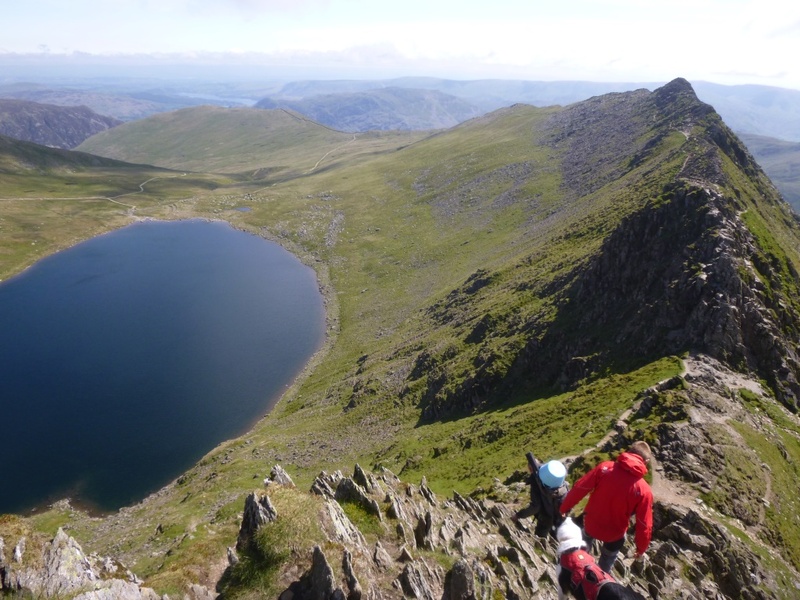 We’ll also be popping back up onto Striding and Swirral Edge just to check how the work from previous years is doing and to get some more grass seed down where needed. Our work programme this year will mainly be focusing on projects that were affected during Storm Desmond, as such many of the projects are being funded by the Rural Protection Agency (RPA), who have granted money to allow works to be carried out. One of the projects that is clear flood damage is the work we will be doing to repair paths that have been taken out by landslips up near Grisedale Tarn. You can see from thepictures, the one landslide is quite substantial and wiped out a large section of path. Landslips visible all around Grisedale Tarn, the main being on far right. 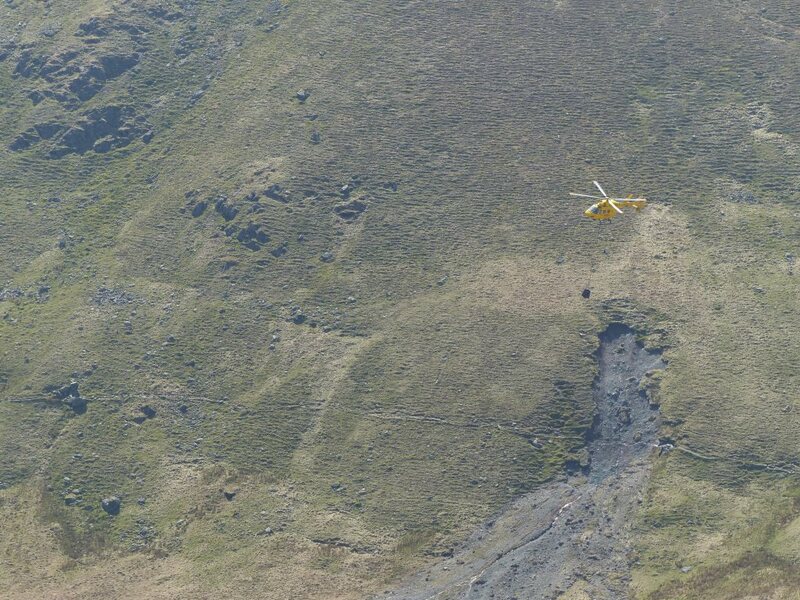 Closer view of the larger landslip, with the helicopter and bag acting as some reasonable perspective, it is a fair old slip! We’ll be heading up there with the aim of stabalising the path and doing some landscaping so that the landscape will, with time, heal itself. These kind of landlips would take a very long time to completly fixed as they are over such large areas, infact when you look around the fells there are plenty of these landslips that are just left to recover as they are not affecting a path. However in this instance we do need to go in and make sure that there is a clear, sustainable and stable line for people to walk through as it is quite a popular route. 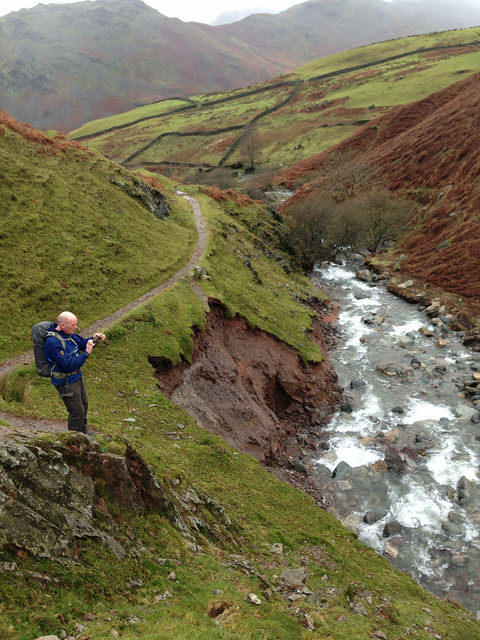 A landslip is also the reason for us heading to Tongue Ghyll. This work site is much lower down the valley and again, the path is at risk because of a landslip that occured during the floods. In this instance however it is not safe to stabilise the path, due to the proximity to the river. As such we are having to divert the path to a much higher line. To do this we will be creating a short section of bench path similar to that which has been built on Carlside and Bracken Hause. Our other projects are a bit more what we’re used to with a good combination of stone and landscaping work. Up Far Easedale we shall be adding a new section of pitching right at the very top of the valley, through what is now quite a boggy section of path. This project alongside the work on Greenup Edge are proving to be quite exciting for the team. As not only will we have a shed on site (huzzah! ), but it is also looking like we shall be using some fell ponies to help us get the heli-bags onto site ready to fill with stone. Watch this space for more information on that! For now we shall be making sure that everything is in place ready for the fell season to begin fully in April. That means heading up to stone sites to gather rock ready for the worksites. With 260 bags (equates to over 200 tonnes of stone!) needed for projects this year it’s going to be quite an undertaking! With all stone gathered locally to the worksites, it is moved the remaining distance to site with a helicopter ready for work to begin. For now though we shall enjoy the remaining few weeks left on property. Our last job is to work on the drainage and walls near Hallgarth. Due to increased pressure from vehicles on the track and water running along the track the walls are at risk of collapse due to their foundations being undercut. By going in and first taking water off the track with numerous techniques (pipes, water bars, side drains), we are then able to go in and stabilise the walls maintaining the boundary for hopefully many years. This work was generously supported by Lakeland 100, who donated £6000 towards the work we have undertaken, so a big thank you to them! The pipe going in to take water from theside drain running down the right of the picture, we will then rebuild the wall!